Much has been written about safety in the deserts and mountains. Nevertheless, reminders are good. No matter what time of year you go, take plenty of water and a small first-aid kit, wear layered clothing, follow a map, be aware of snakes on trails, take a whistle, dispose of trash properly, respect wildlife, and let someone know where you're headed and when you expect to return. Read up on what you can expect to experience. Books and guides are available at the Bobcat Bookstore at the Visitor Center on Highway 74. Also, take binoculars. You may be in for some surprises. If you plan to camp or hunt (in season), ask about permits at the Visitor Center. palmsprings) for volunteer opportunities or work with organizations such as the Friends of the Desert Mountains and the Forest Service Volunteer Association. Opportunities include working at the Visitor Center or the Bobcat Bookstore, helping with guided walks, participating in special events to "meet and greet," giving nature talks, and joining cleanup groups. For information, call Vic Scott, Friends of the Desert Mountains volunteer coordinator, at (760) 862-9984, or Melinda Lyon of the U.S. Forest Service Volunteer Association at (909) 382-2929. Take a journey and discover one of North America’s most unique and diverse mountain ranges. 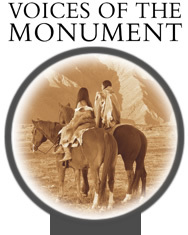 Learn about the native Cahuilla Indian Tribes and how they survived in such extreme environments. Soar over some of the most spectacular geological landscapes from indigenous palm oasis to one of the largest rockslides in the world. View spectacular footage of the endangered and illusive Peninsular Big Horn Sheep; plus a range of animal, bird and plant life encompassing five different life zones. Shot in spectacular high definition HDTV you'll experience the detail of this diverse and seldom seen land. 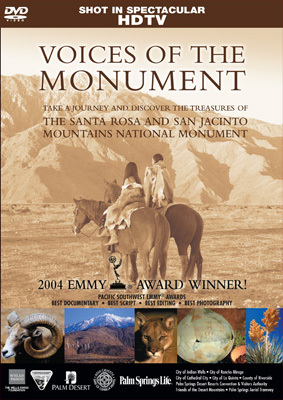 Proceeds from the sale of this Emmy® Award winning documentary will go to the Santa Rosa and San Jacinto Mountains National Monument. © 2005/2006 Desert Publications Inc..